Early praise for the audiobook. A new bestseller about Fauci's role in the HHV-6 and CFS cover-up.! We are supported by visitors from all over the world like you. All you have to do to help us continue covering the evolving HHV-6 and Chronic Fatigue Syndrome story is this: please purchase one of our books or listen to the songs below on Spotify. We get paid every time someone purchases one of our books or listens to our songs. If you have Amazon Prime you can have a copy of The Chronic Fatigue Syndrome Epidemic Cover-up in your hands in just a couple of days. Or start reading on Kindle immediate. Or listen to the amazing audiobook version. Please also check out our book about Anthony Fauci's role in the cover-up of the real CFS and AIDS epidemic. Fauci: The Bernie Madoff of Science and the HIV Ponzi scheme that Concealed the Chronic Fatigue Syndrome Epidemic is available now on Kindle. We also hope you will contribute to our Go Fund Me Campaign which is distributing this book to members of Congress and the media in order to raise awareness about the HHV-6 and Chronic Fatigue Syndrome epidemic. Please come back for more news about HHV-6 and the long list of medical conditions it seems to be causing. At Amazon in the U.K.
Did you like the audio excerpt? Purchase a copy of "The Chronic Fatigue Syndrome Epidemic Cover-up"
Purchase a copy of "The Chronic Fatigue Syndrome Epidemic Cover-up Volume Two"
Purchase a copy of "The Stonewall Massacre"
Why there is no major epidemic of Chronic Fatigue Syndrome in the African-American community. The Chronic Fatigue Syndrome Story of the Year. Listen to the interview with Hillary Johnson, the pioneering MECFS journalist. Preview the novella about the racist politics of Chronic Fatigue Syndrome and AIDS. The Story behind "The Lady Upstairs," the ME/CFS anthem. Preview our explosive story about the politics of Chronic Fatigue Syndrome and AIDS. On Amazon in the U.K.
On Audible in the U.K.
Click to listen to "The Lady Upstairs," the Chronic Fatigue Syndrome anthem. A message to our visitors from Italy. A message to visitors from the U.K.
A message for our visitors from Japan. Is the HHV-6 Epidemic also the HERV-K18 Epidemic? Is HHV-6 Transmitted by Pigs? Is HHV-6 a Pig Virus? Is HHV-6 really a porcine herpesvirus? Please support our Go Fund Me Campaign so we can continue reporting on the cover-up of HHV-6/7/8, Chronic Fatigue Syndrome, and Kaposi's Sarcoma epidemic which now threatens everyone. If you have Kindle Unlimited, right now you can begin reading these six important and provocative books about the epidemic of HHV-6 and Chronic Fatigue Syndrome that threatens everyone's health. A message to visitors from Italy. A message to visitors from Germany. A message to visitors from France. Our audio book about the sexual politics of Chronic Fatigue Syndrome. The letter NIH Director Francis Collins should send to the Chronic Fatigue Syndrome community. Our audio book about the racial politics of Chronic Fatigue Syndrome. Why Kaposi's Sarcoma in Chronic Fatigue Syndrome patients could force the CDC to tell the whole truth about the epidemic's connection to the AIDS epidemic. 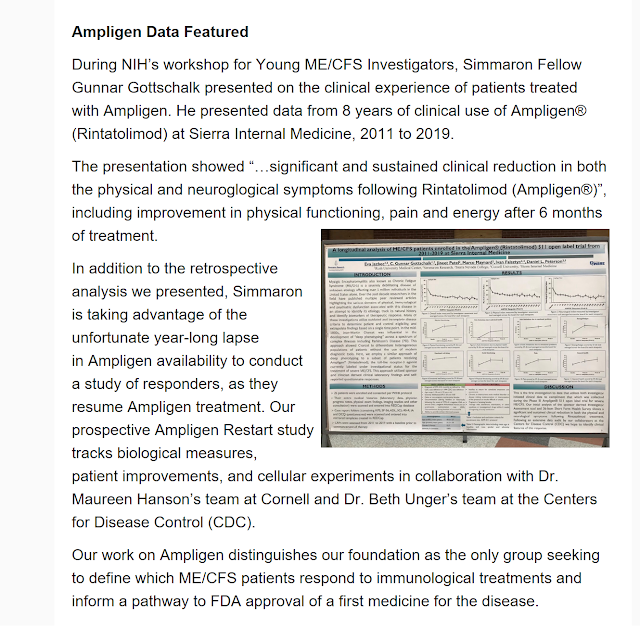 Neenyah Ostrom on the promise of Ampligen for HHV-6, Chronic Fatigue Syndrome, and AIDS. Is Chronic Fatigue Syndrome the other AIDS epidemic in the gay community? Does HHV-8 viral load raise questions about the legitimacy of HIV viral load? Was Judy Mikovits destroyed because her XMRV work would have ultimately shown HIV is a total fraud? Early praise for "The Chronic Fatigue Syndrome Epidemic Cover-up"
If you want to change the world for Chronic Fatigue Syndrome patients, focus on Kaposi's Sarcoma. More evidence Anthony Fauci has been running an HIV Ponzi scheme? Transmission of Chronic Fatigue Syndrome between people and their pets. Is it HHV-6? Let's Make Chronic Fatigue Syndrome a Public Health Priority!